My grandmother Alta Sage Lee with her second husband, Clifford Dixon. I think one of the better white lies my family has conjured up through the years was the one told by my maternal grandmother Alta Sage Lee (1909–2004). I believe it was a lie she didn’t mean to tell, but one that just got away from her – you know, the way most lies do. This white lie had to do with her marriage to her second husband, Clifford Dixon (1912–1985). 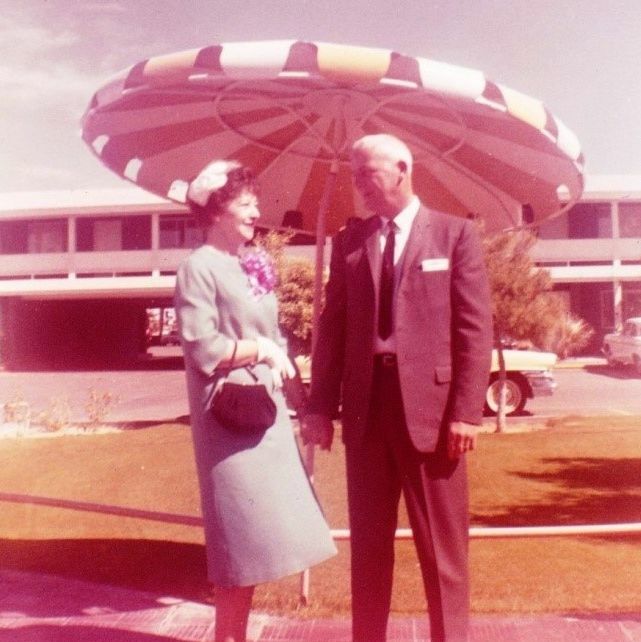 The marriage was a “destination wedding,” possibly in Las Vegas about 1962, with my parents standing up for them. Prior to this event my grandmother had been divorced for better than a decade, and Mr. Dixon had been unhappily married for years with his wife Edna refusing to grant him a divorce. Exasperated and in love, Clifford had decided to take an alternate route obtaining his 1961 divorce in Mexico – though there was some discussion at the time that the divorce would not be valid – and that it was just a ruse to trick poor irascible Edna. Indeed, by all accounts my grandmother and Clifford’s Las Vegas nuptials should have stood out as a longstanding if not ill-begotten betrothal “hit” – but karma often has other plans. I am not sure how my grandmother and Mr. Dixon discovered the invalid nature of their marriage. By the late 1970s they were well past applying for Social Security or pensions, or for some other application that might have required proof of their marriage. Whatever the circumstances, I believe my grandmother must have been unnecessarily embarrassed to discover that she had actually been ‘playing house’ with Cliff for so many years. 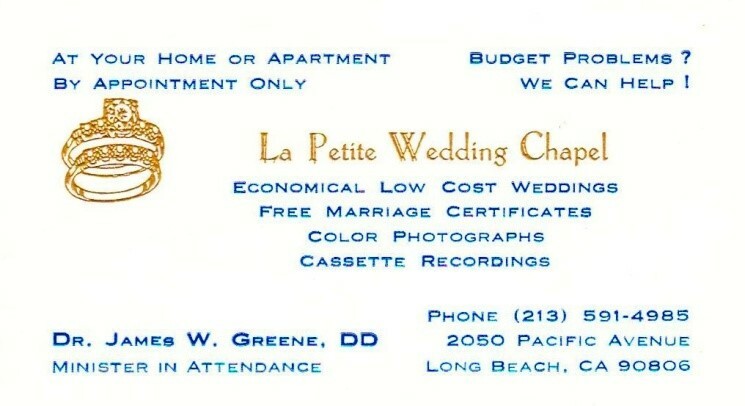 They found their best solution straightaway by visiting Long Beach’s discreet and budget friendly La Petite Wedding Chapel (now a barber shop) to tie the knot confidentially – like a couple of teenagers eloping without their parents’ consent – and, of course, never telling a soul. And so the case of this “white lie” would begin. My grandmother was a wonderful woman, but she remained a mistress of many white lies to the bitter end. By all accounts she and Clifford loved each other very much – so perhaps the intent behind their white lie was somehow pure enough that it really didn’t matter. It is hard to know. Clifford wouldn’t live too many more years after that second (?) 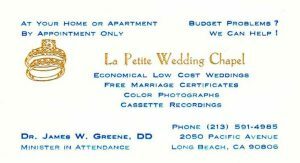 wedding, but Alta Sage would live another 25 years and never utter a word about her faux wedding in Las Vegas, nor her secret one almost two decades later. My grandmother knew how tell a lie and to keep a secret – especially a passionate one. In light of this, who knows where all of our other white lies just might be hiding? [i] Fr. Stephen Freeman, Ancient Faith Ministries, blogs.ancientfaiths.com, November 2007. [ii] Eileen Johnson, The Children’s Bill of Emotional Rights: A Guide to the Needs of Children (Lanhan, Md. : Jason Aronson, 2012), 37. [iii] The Gentleman’s Magazine, London, December 1741, 11: 647. 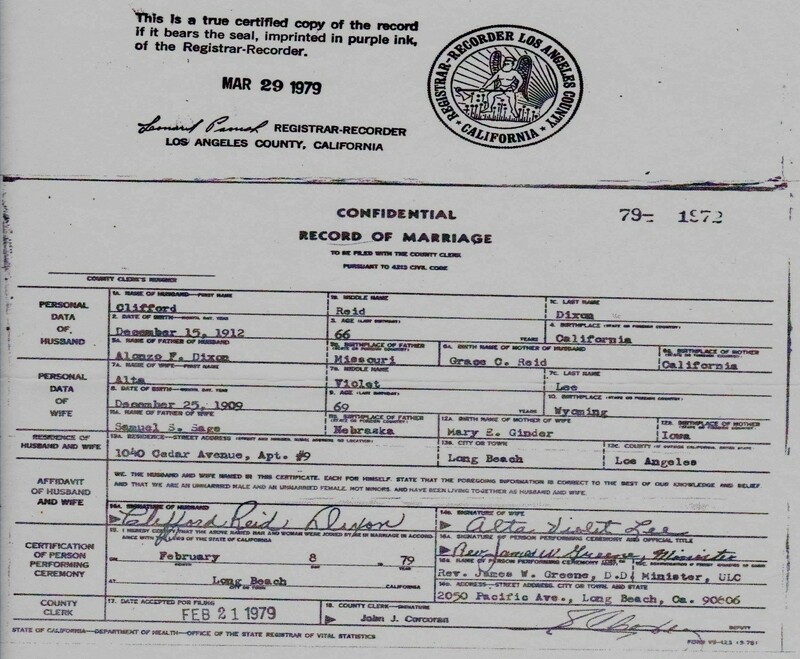 [iv] Nevada and Arizona Marriages Indexes, Ancestry.com, along with the family recollections of my father Jack L. Record. The California Divorce Index at Ancestry.com indicates that Cliff and Edna were divorced there in 1979. I enjoyed your essay. It reminded me of my own story. In cleaning out my mother’s house after she was placed in assisted living, I discovered: 1) My parents’ marriage license dated January 2, 1944, but ripped up and pieced together with Scotch tape. 2) Papers finalizing Dad’s divorce from his first wife, dated January 2, 1945, and 3). 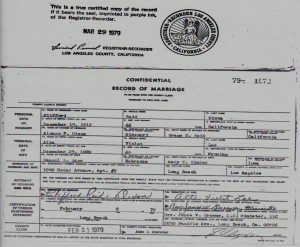 Another copy of my parents’ marriage license, this time with a minister’s verification that he performed their marriage on February 23, 1945. This was all very surprising to me, since I was born January 11, 1945! They had always pretended that they married February 24, 1944! They even let us celebrate their 50th Wedding Anniversary a year early and said nothing. 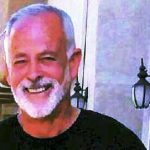 At the point of discovery, Dad had already died, and Mom had dementia, so I couldn’t ask them about it. I often wonder why they didn’t marry as soon as Dad’s divorce was finalized, but knowing Mom, I suspect she didn’t want to stand before a Minister of the Gospel in her 9th month of pregnancy. As I approached my teens I was already searching for information regarding her family (unbeknown to her) and seeking the truth as it should be. One would expect that I would someday be uncovering something dreadful. That never happened. I uncovered some facts that might of been frowned on in that era but nothing horrible. One main fact was that her parents had divorced and several years later her mother remarries. I also found and proved that her father was an Illegitimate child living with parents (who were actually his Grandparents) and his real Mother whom he knew as an older sister. I also discovered my mother had a brother and a sister. The woman I thought was my Grandmother was none other than a family friend who she had adopt her at age 21. Another question ???. It seems that my real maternal Grandmother married a man from New Brunswick Canada and the family moved to his family farm while he continued to work for the RR. My mother was unhappy in Canada as she missed her Grandmother and tried to run away. So they decided the best thing was to bring her to her Grandmothers to live in Northern NYS. Her Grandmother got ill and she was going to go back to her mother but she acted so badly that’s when the family friend offered to care for her and needed her help on her farm as she also was a Nurse. My real Grandmother by this time had 4 additional children (half siblings of my mother). So mother remained where she wanted to be. As time went on my Mother dreamed up the Life she wanted in her dreams and as she graduated from school and went on to Business college she gradually ceased all contact with her entire blood family (all her siblings) and even the Grandmother who she had lived with who died (per entire family) of a broken heart. My mother then went on to live her imaginary Life as an “only child” of this family friend or as a poor Orphan as she told myself and my siblings. I went on to research my entire family (against my mothers wishes) only to prove to my Mother that her real family (whom she had given up) had much in their Past to be proud of and nothing to be ashamed of. This is my DAR Patriot line. None of this was considered as Lying. None of this was meant to hurt anyone, but it did. Only after my mother’s death at 95 did we find a large stack of letters tied together with a ribbon, from her real mother (the Grandmother I never knew) who wrote to her every year, every Birthday until she died begging my mother to forgive in her heart any unknown reason she had chosen this path, telling her she loved her and if she didn’t ever see her hoping they would be united in Heaven. I am descended from Elizabeth Fones Winthrop Feake Hallett (1610 – 1706). She could not divorce Robert Feake in Stamford (Connecticut) because the English would not allow it. She was living in Greenwich, which was Dutch at the time, and they didn’t care. She purported to obtain a divorce and then married William Hallett. Trouble occurred when the Dutch turned Greenwich over to the English in 1664, and the validity of their marriage was questioned. The couple quickly moved to Long Island, which retained a strong Dutch influence, and lived happily ever after. Yes, I have read this accounting thru research, but, alas, it was not my lineage, but oh, I loved the story and there is a book written much like the ‘scarlet letter’ theme…..then……a DNA cousin told me the correct (?) lineage……and I pouted for weeks….. It is important to remember that prior to the 1960’s and ’70’s, in most states it was pretty difficult to get a divorce. No-fault divorce has been around for so long now, and we think of divorce as being so prevalent and almost routine, that we often forget just how difficult it was to get a divorce before no-fault divorce laws were enacted. Prior to that, a person wanting a divorce had to PROVE in court that the spouse had committed a marital crime, i.e. adultery, abandonment, cruelty, etc. If the opposing spouse didn’t want the divorce and hadn’t committed the marital crime, he/she did not have to agree to the divorce. The Mexican divorce and Los Vegas wedding remind me of any number of Perry Mason episodes! My uncle by marriage was adopted, as was his older sister, but it is unknown if they were bio siblings. Apparently their mother intimated that there was a “story” to be told but not until her death. The sister always thought there was some royalty in her ancestry. My uncle didn’t care. I remember being told this story of the “big secret” maybe when I was a teenager. Unfortunately, when the adoptive mother died, any secret she meant to tell went with her. Meanwhile, many years later, I am helping my cousin look at her DNA matches that don’t match me or my siblings as a way of potentially uncovering my uncle’s ancestry. Just a few weeks ago there appeared a viable match or two at long last (1-2nd cousin)–just waiting for a response at this point. I too have Martha Allen Carrier in my family. We should talk. My Goodness! I have direct line to Rebecca Blake (condemned but not executed), m to Robert Eames. Her sister, Prudence, m Moses Tyler, also direct line. There are ties to other ‘witch families’, but not direct line. Yes, we need a ‘converstion! Very interesting post, I’m sure many of us are sitting and wondering if what was said in 1950 was really true! In 1979, Alta and Clifford Dixon might have been thinking about whether Alta would be able to inherit from Clifford and receive his widow’s benefits under Social Security, etc. The 1979 marriage might have been an attempt to remove any possibility of Edna claiming them. My father’s sister was always known to us as Aunt Dorothy. Census records always listed her as Dorothy or Dorothy Harriet. I recently found her real birth record, and she is listed as Agnes Harriet. Since she was born only 5 months after my grandparent’s marriage, I wonder if their intention was for no one to find out her real name and therefore the misstep in her conception.